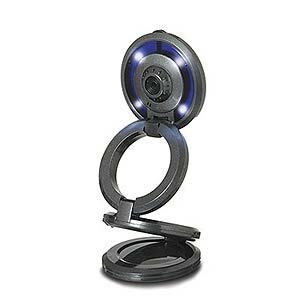 From Jasco comes this Collapsible Webcam which can not only save space, but is also capable of shooting shots in just about any direction by twisting the ring design in a variety of angles. For low light conditions, the Collapsible webcam is designed with four ultra bright LEDs and can record full 640×480 video at up to 30 fps with it’s 300k pixel CMOS sensor. It also has an integrated microphone and comes in any color you want so long as that color is black or white. Other specs include a focus range of 1 1/4″ to infinity, auto white balance, and snapshot buttons for still images. It can either fit on laptops as thick as 9/16” via it’s laptop clip or as a stand alone with its adjustable stand, which allows it to collapse into a protective shell by dropping down to a width a fraction of it’s size. Also includes software for not only photo and video messaging, but also a ‘monitor’ function for use as a security camera. Dimensions are 1 7/8″ high x 2 3/4″ diameter (folded); 7 3/4″ high at maximum extension.